Five colors in line! 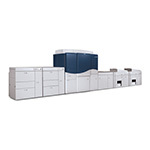 The iGen 5 is the new flagship of Xerox' high-end color production fleet. It is intended to meet the increasing demand for digital color. According to InfoTrends, 87 billion color pages will be printed in the world in 2018, compared to 60 billion this year. The new models are vailable at three print speeds (90, 120 and 150 ppm), and can print onto formats up to 364mm (14.33 inches) wide and 660mm (26 inches) long. The optional fifth color is intended to support a wider range of Pantone or direct tones without impacting on productivity. Orange, green and blue options can help adhere to corporate visual identities, helping to keep short series from having to be run on offset presses. According to Xerox, colors can be changed in half an hour. This press is available with Freeflow or Fiery workflow.